This little doll is so cute. She measures 2 1/2" tall when extended full length. All limbs and her head are moveable. 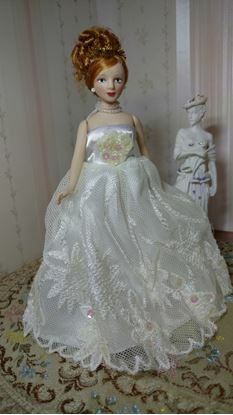 The head is a bit loose and might need tightened, this is not something I am willing to do because she works fine to me. She has on a crochet dress, hat, and booties. 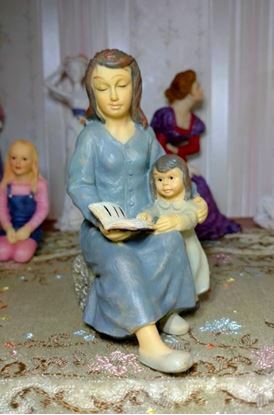 She us under 3 1/2" tall. Moveable arms and legs. The are all under 3 1/2" tall. Moveable arms and legs. I am including two extra that are not pictured. 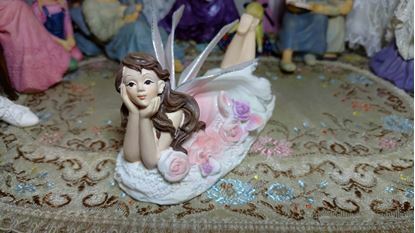 She is made of polystone and she measures 4" long x 2 1/8" wide and 2 1/2" tall to the top of her wings. 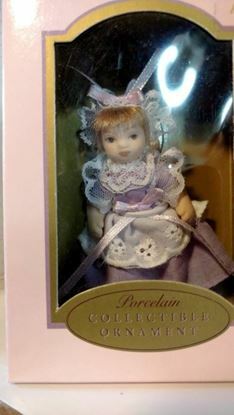 She is 6" tall and made of Porcelain, moveable arms and legs. Made by Show Stoppers. 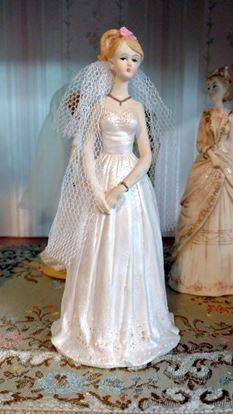 Her dress is loose in the back and needs to be refastened or reglued. 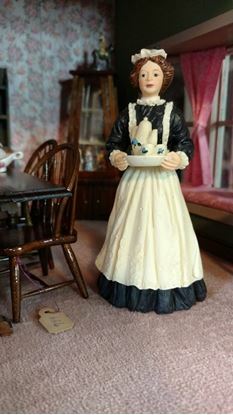 Town square miniatures doll, the shopkeeper. He is vinyl or rubber and stands just under 6" tall. 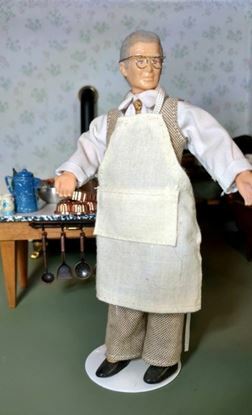 He has on glasses and an apron. No stand included. Woman holding her knitting. 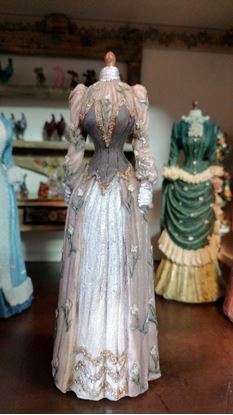 She is 5 1/2"" tall made of resin. Mom and daughter reading a book. 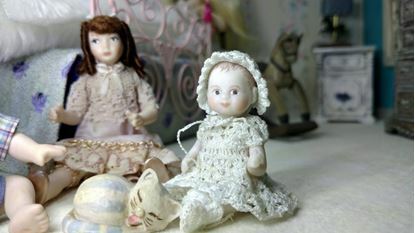 Doll height is 4", width is 3". The piece is made of resin by K's Collection. 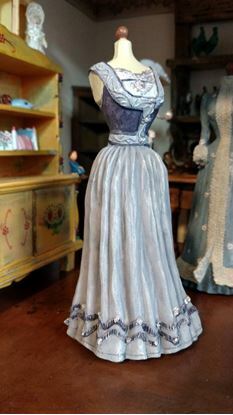 Victorian dress on form. Made of resin. 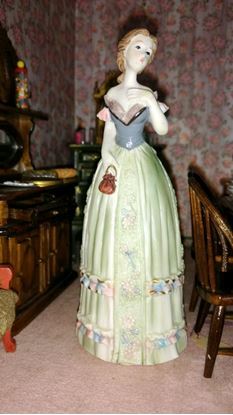 Stands 6" tall including the hat, and it's approximately 2" wide from outside pearl to outside pearl. Perfect for a womans dressing room or clothing boutique. 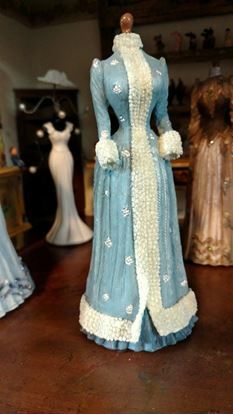 Victorian dress on form. Made of resin. 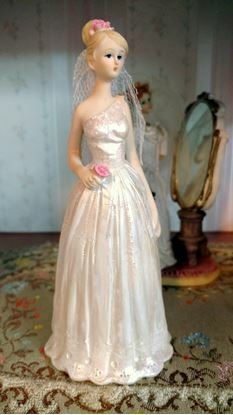 Stands 6" tall and it's 2 1/2" at the of the dress. Perfect for a womans dressing room or clothing boutique. Made by K's Collection Fashion Series. 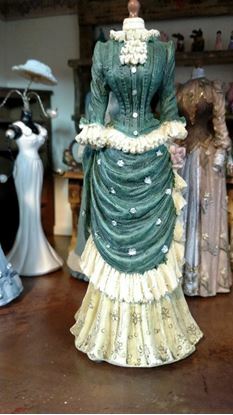 Victorian dress on form. Made of resin. 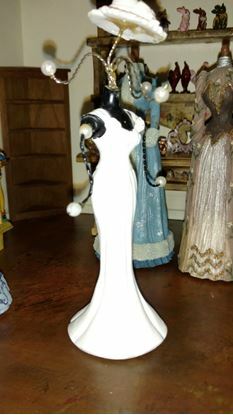 Stands 6" tall and it's 2 1/8" at the of the dress. Perfect for a womans dressing room or clothing boutique. Made by K's Collection Fashion Series. 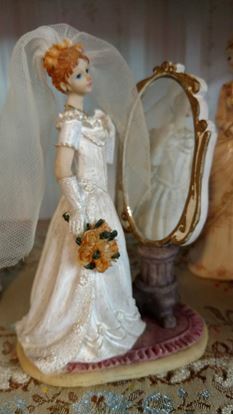 Pretty Bride that measures almost six inches tall to the top of her bun. She is 2 1/2" wide at the thickest section of her dress. Pretty Bride that measures almost six inches tall to the top of her bun. She is 3" wide at the thickest section of her dress. Pretty Victorian Bride with on a rug with a mirror. 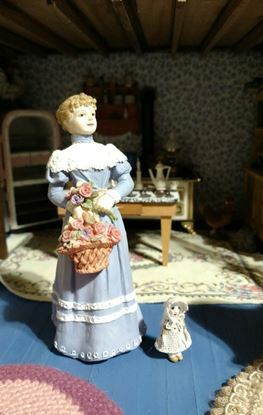 She stands 5 1/4" tall and she is 2 1/2" at the base of the rug. The length of the rug in the long direction is 3 5/8". 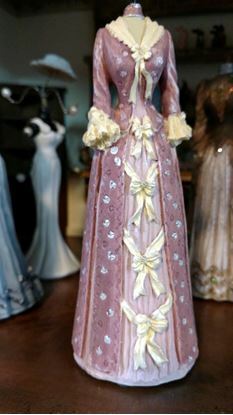 Resin woman maid standing with a tea tray in her hands, she is 5 1/4" tall and 2 1/2" at the widest part of her dress. 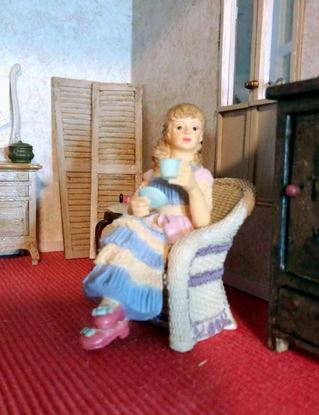 Resin girl sitting in a resin (wicker look) chair. Doll is not attached to the chair. Doll height is 3 3/4", width is 2" including the chair. There is putty residue on the seat and on her bum. 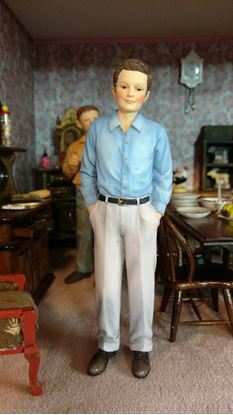 Handsome Man with hands in pockets 6" tall made of resin.